Several forms of graphene-based magnetic materials have been investigated via density-functional theory utilizing dispersion correction and full geometry optimization. Our calculated results show that the perinaphthenyl radical (R1) has a spin of 1/2. However, in its [R1]2 dimer structure, the net spin becomes zero due to an antiferromagnetic spin-exchange between radicals. To avoid antiferromagnetic spin-exchange of identical face-to-face radicals, the alternating stack of composition R1/D25/R1 (with D25 = graphene-based diamagnetic molecule C34H16) has been designed and investigated. As expected, our calculated results confirm that the alternating stack R1/D25/R1 has a ferromagnetic spin-exchange between two R1 radicals with the spin-exchange coupling of J/kB = 277 K, and the spin moment of m = 2 μB (Bohr magneton unit). 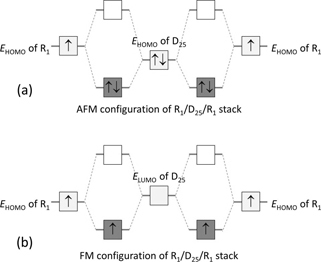 In order to explore ways to tailor spin-exchange coupling in stacks, five other R1/D25/R1-based alternating stacks with different ligand configurations of R1 have been designed and investigated. Interestingly, ferromagnetic spin-exchange in stacks can be enhanced by substituting ligands having a weak electron affinity for H atoms of a R1 molecule, while it can be weakened by substituting ligands having high electron affinity for H atoms of a R1 radical. These results can be explained in terms of the competitive hybridization between the HOMO (highest occupied molecular orbital) of radicals and the HOMO and LUMO (lowest unoccupied molecular orbital) of diamagnetic molecules. These results would give some indication for how the spin-exchange coupling in graphene-based alternating stacks can be tailored.